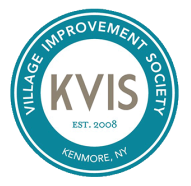 One of the aspirations we hold dear as an organization is the hope that as residents become more involved in their community through the KVIS that voter participation here will increase. We make sure that we consistently let people know when elections take place and encourage everyone to move past a personal place of voter apathy toward active participation in our democracy. We strongly believe that the right to vote is an obligation of citizenship as well as a right and we encourage everyone to make the effort to vote. The KVIS has voter registration forms available to anyone who is not currently registered to vote. The form is easy to complete and we’ll mail one out to you–just contact us and we’ll get one to you right away. A teal disk on a grey field describes the KVIS tshirt. You'll often see our volunteers proudly wearing it. It's a quality crew neck shirt made of 100% cotton; it washes like a dream and it's very comfortable. If you like any of the events and initiatives described on this website, please consider purchasing one. Our web store is not in business yet but we are putting the parts in place to open it soon. Until then, just phone or email us if you'd like one and we'll arrange for payment and will get it to you right away.